Is Thibs the Modern-Day Jerry Sloan? | Hard hat. Lunch pail. Is Thibs the Modern-Day Jerry Sloan? 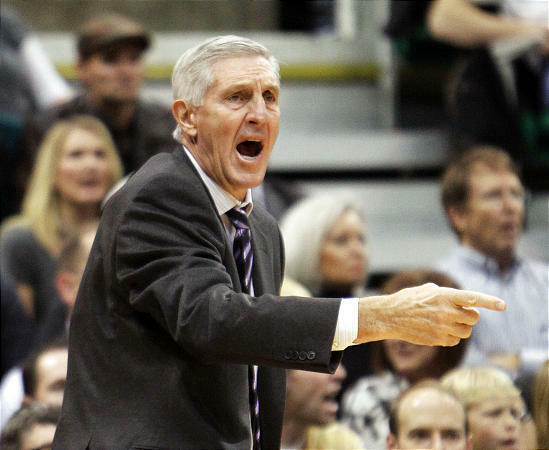 Jerry Sloan hollerin'. Photo Credit: desertnews.com. Thibs screamin' till he goes hoarse. Photo Credit: kingjusportsmind.blogspot.com. 2. The modern-day game and its superstars are different. So the media, both mainstream and niche, are abuzz with the sudden resignation of Jerry Sloan. Much of the coverage mourns the loss of someone who has been an institution in the NBA, in the minds of sports fans everywhere, and in Utah. Some of the coverage talks about how there has been a sudden rash of major retirements (across all sports). With the potential retirement of Phil Jackson, we’re left with Greg Popovich as the lone mainstay of a rich generation of NBA coaches. That begs the question – who’s next? Undoubtedly, the next crop of great coaches will look and sound a lot different – there’s greater diversity among coaches and they’re tasked with coaching younger, stronger, and richer players in a more intense pressure cooker than their predecessors ever dealt with. Is there even a place in the NBA or any professional sports, for the sort of hard-nosed, straight-talking, somewhat-crotchety coaching style that defined Jerry Sloan? I’d argue that in any sports market outside of LA, NY, and South Beach, the answer is yes. 4. He refuses to use injuries or the team’s schedule as an “out” for poor performances. A poor performance is a poor performance and a good performance can always be a better performance. He’s almost Tiger-Mom-esqe in this regard. As this is Thibs’ first season as head coach, the jury is still out. Of course, if he is, this also means that Thibs will always be in the discussion for Coach of the Year but will never actually win it. You know what? If Thibs leads the Bulls to some championships, I’m perfectly ok with him never winning COY (and I think he would be too). Part of Thibs’ success can be attributed to the fact that he has a Derrick Rose, who is one of the most unassuming high-level NBA players I’ve ever seen. I would be stunned if he ever pulled an “Iverson” – he just got his first ever technical this year. (as in, first one in his life). Would Thibs’ approach work with another superstar, say, MeloDrama? Who knows. But you know what? Who cares – go Bulls!